I thought everyone would be at the beach. It was a hot Saturday and I suspected we’d have a little more elbow room at the Getty with everyone else optimizing a beautiful day bicycling or playing volleyball at the beach. I forget that despite its sprawl, LA is still a crowded place, and I’m not the only one who likes a good dose of ‘Kull-cha’ on their day off. There was a jam getting into the parking structure. Then, after stall surfing to level P5, we emerged by elevator to find a line waiting to take the tram up to the museum: “…half-hour wait for the tram…the second tram is not working…you can walk up in 15 minutes…there’s a cool breeze…” the Getty crowd-wrangler hollered (they couldn’t tell us this when we paid to park?). 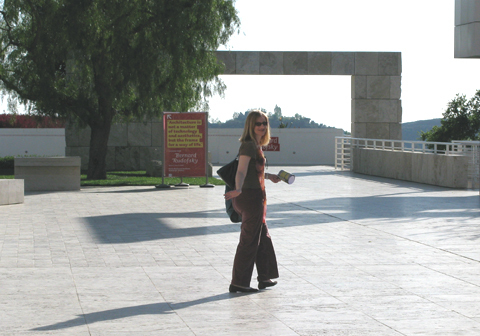 John and I have been to the Getty many times so we knew we would surgically-strike what we wanted to see -the museum fatigue factor was less daunting. We took on the walk and proceeded past the crowd…we walked…uphill…in the hot sun. By the midway point there was no stand offering complimentary water or the Getty umbrellas for those who alleviated tram demand and braved the hike (with the awareness that the ivory travertine reflects heat, the Getty provides umbrellas for visitor comfort). At this point the tram breezed by and I shouted: “I HATE you!” to the collective that chose to brave the line rather than the heat-scorched, forced march we elected to take (actually, the “I hate you” was more of a soft-shout – for my own amusement and to entertain John). The latest exhibit is “California Video“. You can hit the ‘skip’ button on this show. I thought the gallery and the attendees altogether were the exhibit. Visitors commuting, paying for parking, braving the tram crowd or the scorched hike to sit down and put on head phones to watch TV?…and, from what I could see, public-access-cable quality shows – (Youtube?). I’m already resistant enough watching TV in my own home, I had zero patience and fortitude to do so at the Getty. The last gallery of this exhibition, however, offered some engaging works: “Home Movies” by Jim Campbell presented an intriguing, dialectical, perceptual play of viewing impressionistic video through an “aperture grille” (tension mask)-like grid of LEDs. The visual effect made me feel too close and too far away at the same time; Bill Viola’s “Sleepers” was provocative – video of people sleeping viewed on monitors submerged in drums of water? Hmmm…sleeping is a suspended state much like floating in water, however, you can’t breathe under water, it suffocates. I felt like the exhibit needed each drum of water, through which the sleeper was viewed, to release a stream of air bubbles in a breathing rhythm. But that would undermine the artist’s desired effect of tension and make the work outright kitschy; then, as for the video of the melting ice cream cone (by Meg Cranston) projected on the gallery wall (contextualized with a resin-coated collage of images on the floor), I don’t know why, but I could have watched that for a while except that there was no place to sit (sigh). Click here to see samples of what I’m blogging about. We moved on to a distant corner of the campus we hadn’t explored before. At the library, they opened up a gallery for an exhibit on Bernard Rudofsky and I became a fast fan. 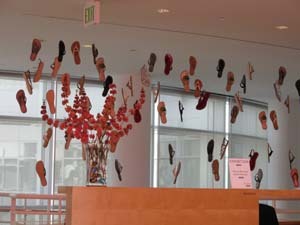 I was already dazzled by the backdrop of Bernardo sandals suspended at the gallery’s approach. I was actually eyeing some Bernardo sandals the night before. I remember my sister had a pair back in the ’70’s. I liked them so much I saved my money and bought some cheap knockoffs at Safeway groceries. I was able to wear them the whole summer (everyday probably) before they broke. My sister’s authentic Bernardo’s were much more comfortable though with their supple leather and they never broke. So I scanned these shoes to find my favorite style and presumed they were on display because of corporate sponsorship. In the Rudofsky gallery I found lush watercolor paintings, John spotted the “Casa Frontini” model and said: “this is our house” and around the corner the exhibit continued with Rudofsky’s commentary on fashion and sandal designs – “Oah!” He’s Bernardo! : architect, writer, sandal designer, my new best friend (if he were alive today). That night I looked up the shoes I previewed the night before. The “Mistral” was the style I had in the ’70’s and it looks as though the remake has a slimmer ankle strap than I remember (white pair pictured). I found a pair by another brand that had the line I remember and a block heel for a little leg-flattering lift (brown pair). I got those instead. As for brand loyalty, I’ll still keep my eye out for Bernardos. I’m worried the pair I got is going to break.